MAGICK RIVER: Best Cartoon of the 20th Century? My friend Dennis sent me this today. I'm not sure it qualifies as the Best Cartoon of the 20th Century, but it certainly is topical and absolutely relevant in the light of - or, rather, the darkness of the last days of Umno/BN misrule. 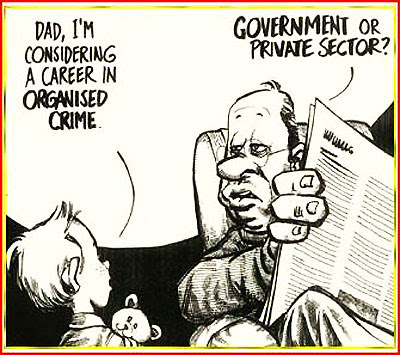 If you like paperwork, organized crime in government in potentially lucrative. Government - join any intelligence agencies. be a licensed killer, lol. Private - be a CEO of multinational company which have power to influence the politic within a country. This is certainly relevant to our BN style of governance. Under BN being in politics is one easy way of becoming a billionaire.